After action light episode of "The Plan," "The Prisoner" kicks up it again and does something unusual for Vikings: picking up from a cliff-hanger and ending on another cliff-hanger. The Saxons have found York abandoned by the Vikings and celebrate their victory. However, Ivar the Boneless (Alex Høgh) is always a man with a plan, and traps The Saxons once again in the Northern English city. Bjorn Ironside (Alexander Ludwig) and his small band of Vikings find themselves in Egypt and meet Emir Ziyadat Allah (Khaled Abol Naga) to discuss trade but end up getting involved with the war between the Arabs and the Byzantine Empire. Kattegat Floki (Gustaf Skarsgård) returns from the uninhabited island and asks for people to help him settle his discovery. This puts him on a collision course with Lagertha (Katheryn Winnick), who needs as many warriors as possible for the upcoming war with Harald Finehair. "The Prisoner" is similar to "Homeland," a story from two episodes ago. Like "Homeland," "The Prisoner" starts with an excellent battle sequence where the Vikings hide and trap the Saxons deep into the city before attacking. But this was the same strategy Ivar used during the first battle. It sadly shows a lack of variety. There were fun moments, like Alfred fighting off a Viking with a huge hammer, and there is a hearty amount of violence, including a woman getting trampled by a horse. The aftermath of the battle in the Saxon camp shows the brutality of war with the injured having their limbs chopped off- great for the sadist in all of us. 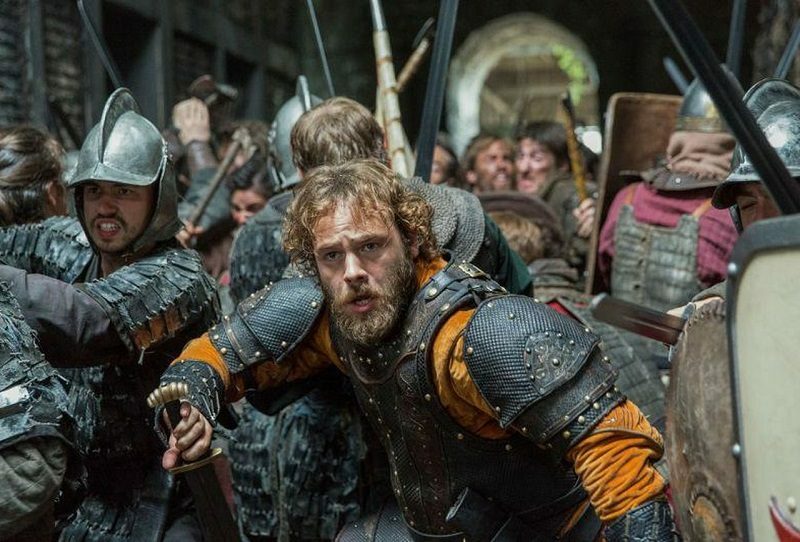 The second battle of York shows more of the battle of wits between Ivar and Bishop Heahmund (Jonathan Rhys Meyers). They both take command of a force directly against each other for a fight and the episode shows their tactics and how they counteract the other. Ivar respects Heahmund and shows mercy, which is out of character for the Viking considering how ruthless and sadistic he has been. The series looks like it's trying to show their relationship developing like Ragnar and Athelstan the Monk's - if a little fiercer. Heahmund is shown to be such a fundamentalist that he has the same logic as a modern day terrorist: no heathen is innocent in the eyes of his God so they are justifiable targets. This is in stark contrast to the Arabs in the episode who welcome people from other faiths and cultures- at least at first. Ziyadat Allah is willing to negotiate with Bjorn, but he is a man who does not accept failure from his subordinates and he comes up with some interesting punishments. One line of dialogue mentions that the Rus (Russian) Vikings protect the Byzantine Emperor, hinting that the Vikings might get drawn into conflicts in the Middle East. The Eastern Vikings are set to appear in the show's sixth season. The religious theme of the episode carries over into Floki's storyline. He sees colonizing the island as a mission from the Gods and, although he doesn't state it, settling the island would be an act of redemption for all the violent acts of his past. Colonizing the island would allow the Vikings to actually live in peace, be away from warring parties, and become farmers with Floki promising bountiful lands. Floki is carrying on Ragnar's dream of the Vikings settling instead of raiding and this is drawn from a historical narrative of people going westwards to find land. The Vikings went to the British Isles, Iceland and Greenland, Europeans went to the Americas, and American westward movement in the 19th century was based on the idea of Manifest Destiny. "The Prisoner" had a solid battle sequence but it was not as impressive as the First Battle of York and the storyline in England was a bit too much lather, rinse, repeat. It was the less actiony, where "The Prisoner" was more interesting with Floki going on a divine mission that could put Lagertha in a bind and the action in Egypt that ended on a heck of a cliff-hanger.